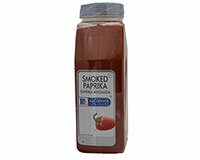 McCormick Smoked Paprika is made from Spanish sweet red peppers that are naturally smoked over wood planks to obtain its distinctive smoky taste. For great color and flavor, use smoked paprika in recipes for chicken, fish, pork, potatoes and rice. McCormick Smoked Paprika is the easiest way to add smoky flavor without the hassle of smoking. It's packaged in a flip-top bottle lets you shake or spoon on the bold flavor and brilliant red color for pennies a serving. With consistent McCormick highest quality, of course. McCormick Smoked Paprika is ideal for a variety of menu items, from delicate sauces to southwestern ribs and Spanish empanadas, Tex-Mex chili, quesadillas, roasted dishes. Smoked Paprika adds great flavor and color when sprinkled on fresh fried chips, fries, or any roasted potato. Add McCormick Smoked Paprika to mayonnaise or butter for a quick compound butter on sandwiches or bread. McCormick Smoked Paprika is great as a coating for roasted beef, chicken, pork and lamb.